Sheila is not pregnant yet. She tells Louis he has an appointment today to make sure he isn’t shooting blanks. She has also made an appointment for herself. At the office, Louis tells Harvey he needs to talk. He is stressed. He cannot go to one of those places and give a sample under stress. Harvey doesn’t want to talk but gives in. They talk. Harvey confesses he thinks about tomatoes. Louis is a little confused but goes with it. Donna comes in. She heard it all. They laugh after Louis leaves. She tells him his brother has called. She demands he calls him back today. Harvey calls Marcus. He tells him he is getting a divorce and he needs him to be his lawyer. Harvey cannot believe it. Marcus confesses he cheated and now Katie his ex-has hired a shark. He cannot lose his kids. Alex’s daughter is at work with him. She got in trouble at school so she had to come in. They have a spat in the kitchen. Gretchen comes in. They talk about kids. He cannot get Joy to listen. Gretchen tells him he needs someone she thinks is cool to talk to her. Louis shows up to make his deposit. He asks the Wall Street Journal. The receptionist thinks he is strange and she doesn’t have anything but the real estate section. Alex goes to Samantha. He needs her help with his daughter. She was once a teenager. She’ll do it. Back at the office, Donna brings Louis some hand sanitizer. She makes some client jokes and how someone is jerking him around. He gets upset. They talk. Louis is scared. What if he cannot have kids? Donna tells him she will be there for him. Harvey tells Donna about Marcus. Donna is scared that this situation will bring up bad things for Harvey. He tells her he has no choice. He has to do it. It’s his brother. Samantha goes to talk to Joy, who has an attitude. She already knows what her dad is up to. They each talk about why they got suspended. Samantha talks about how to know what rules to break. Joy is in for more when Samantha asks her to come along to talk to a client. Harvey visits Katie. She tells him that it is too late. He knows Marcus screwed up. He doesn’t want to see their family ripped apart. She isn’t budging. Sam brings Joy to coffee so she can get into a client’s head who is there as well. Louis asks Donna to go with him to the doctors. She hesitates. Sheila should be the one to go with him for his follow up. Joy gets a recording for Sam of her clients talking. Meanwhile, Harvey meets with Marcus in person. Marcus tells him he made it worse by visiting Katie, he has been sanctioned. Marcus is upset. Harvey tells him he will get him his peaceful settlement. Louis finds out his sperm is fine. But he needs to give up mudding. That will make his count go up. Louis is in shock. Sam and Joy meet with Sam’s client. Sam tells them she knows they ripped off her client’s patent. And she has proof because Joy was there. They are ready to discuss a settlement. Harvey and Marcus meet with Katie and her lawyer. Katie wants sole custody. Harvey gets angry. Katie tells Harvey that Marcus has been doing things that affect the children aside from the cheating. She tells Harvey that Marcus isn’t being truthful. Marcus confesses to Harvey he has been gambling and his daughter caught him so he talked her into lying for him. Harvey is angry, it is just like what his mother did to them. He tells Marcus he is done with him. He is going back to New York. Louis arrives home to a specially made cocktail from Sheila. Sheila knows he has to give up mudding. Louis doesn’t want to discuss it. He will give it up. Harvey’s mother knocks on his hotel room door. She tells him he is right – what Marcus did was horrible. 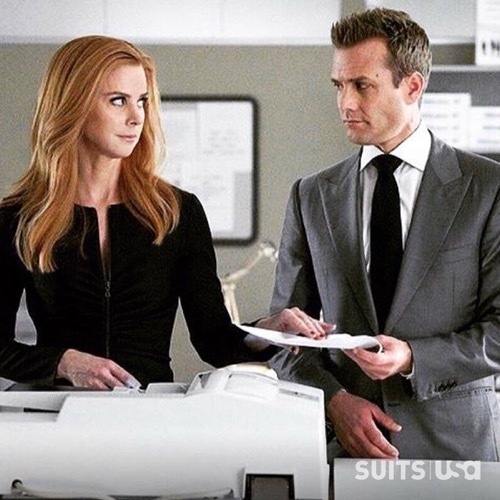 She wants Harvey to forgive and to help his brother. She knows this is all her fault. She doesn’t want Marcus to pay for her mistakes. Harvey tells her they need to talk. But first, he goes to see Marcus. He shows Marcus how he plans to get him joint custody. He hands him a letter. It details how Katie is an unfit mother. Marcus wants nothing to do with it. He refuses to paint Katie as a bad mother. Joy tells Alex all about her day with Sam. Alex is mad. He tells Joy she isn’t hanging out with Sam anymore. He goes to Sam and tells her to stay away from Joy. Sam tells Joy in the office the next day that she needs to value her father. He is the cool one. Joy starts to think about it. Harvey goes to see Katie. He shows her the letter and explains that Marcus won’t let her use it. Maybe she should return the favor and forgive. Louis comes home with mud under his fingernails. Sheila is angry. Maybe he isn’t ready to have a family. He tells her he will give up his membership. Harvey calls Donna. He tells her he feels like this ordeal has taken a piece of him. She thinks he should look at it like he gave a piece of himself. Donna brings Louis a hot drink in a new mug after hearing he gave up mudding. It is the ‘World’s Greatest Dad’ mug. Alex and Sam apologize to one another.